A sphynx kitten comes with a primary vaccination and a pedigree. For leaving Russia, where we are placed, they need to have secondary vaccination (rabbies), to have implanted an ID-chip and to have export-documents - these are small extra costs. 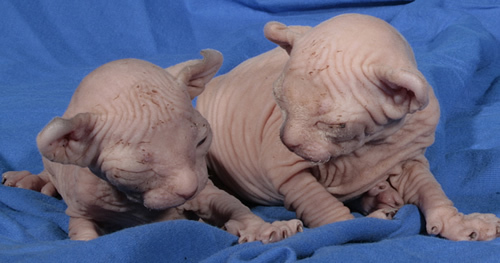 All the sphynx kittens are in excellent physical condition, have all the necessary medical certificates, are very good socialized in a home-atmosphere. We ship only using well known airway companies, where necessary conditions and treatments for pets are guaranteed. You also are welcome to take your pet yourself. Our sphynx kittens leave home at an average age of 4 months. We take a deposit to reserve 50 percent of the cat. If for some reason the buyer can not send more money for the cat and fully pay for the cat and delivery, or refused to purchase, the deposit made earlier (50 per cent, or such amount), are non-refundable. Deposit made for a kitten that is more than 4 months, taken not more than 1 month. If the kitten is not redeemed during this one month, it is deemed a waiver of buying a kitten. No deposit will be refunded. Having received a breeding animal from cattery "BABY RAH", the Owner confirms that he understands, agrees and accepts all terms of this agreement of the Offer. In our nursery new kittens the Elf, Bambino and Dwelf were born! kitten cattery baby rah - SPHYNX female , color - blue point/mink ( a 32/33). 3 m.
kitten cattery baby rah - SPHYNX female , color - CHOCOLATE ( b). 2 m.
kitten cattery baby rah - BAMBINO female , color - turtle/mink ( f 32). 3 m.
kitten cattery baby rah - ELF female , color - white blue eyers. 6 m.
kitten cattery baby rah - ELF male - seal point/white ( dad - lilac). ELF+ELF. 6m. kitten cattery baby rah - BAMBINO male. 6 m.